I can understand why immigration reform is so contentious since it touches on all sorts of hot-button issues, such as jobs, politics, national identity, and the welfare state. 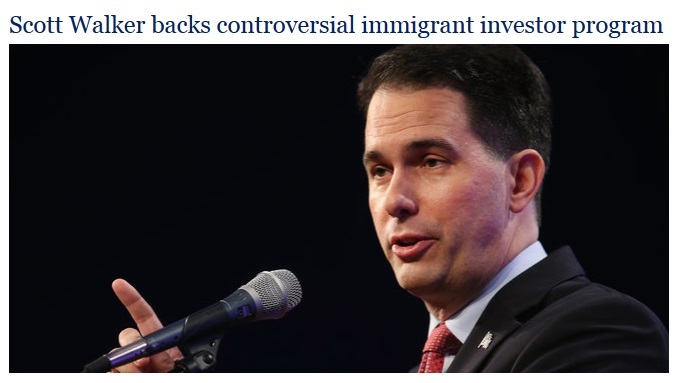 But I don’t understand why there’s a controversy just because Governor Walker of Wisconsin supports a specific part of the immigration system that provides easier access for foreigners who are willing to invest money and create jobs in America. Seems like a win-win situation, but check out these excerpts from a report in the Milwaukee Journal Sentinel. We’ll start with a description of the program. Congress created the EB-5 program in 1990… Under the Citizenship and Immigration Services’ Immigrant Investor Program, foreigners can obtain these visas by investing $500,000 in high unemployment areas — or $1 million elsewhere — in projects generating or saving 10 jobs over two years. According to The New York Times, the federal government puts the green card applications from these foreign investors on the fast track. In general, it takes about two years to obtain legal residency through the program; other visa programs take much longer. Not let’s get to the controversy over Governor Walker’s support. …there’s one federal visa program you won’t hear him attack. It’s the controversial and deeply troubled immigrant investor program. The program — known as EB-5 — puts wealthy foreigners on the path to U.S. citizenship if they invest at least $500,000 in an American commercial project that will create or preserve 10 jobs. Critics have called the abuse-riddled program a “scam” that essentially sells green cards to the affluent and their families, with more than 80% of those in the program coming from China. …David North, a fellow with the conservative Center for Immigration Studies, said…the program is flawed in its premise. “I think it’s immoral, fattening and otherwise unattractive to sell visas, which is what we’re doing now,” North said. By thew way, there are reasons to be unhappy about the EB-5 program, at least in the way it operates. I’ve already shared examples of how political insiders are manipulating the program for cronyist purposes. But today let’s look at the concept of whether it’s good to have an “economic citizenship” program. And we’ll start the very relevant point that any immigration system is going to be arbitrary. A lottery system is arbitrary because you get to come to America because of luck. A family-reunification system is arbitrary because you get to come to America because of your genes. A system based on refugee status is arbitrary because you get to come to America based on geopolitical circumstances. Even an “open borders” system is arbitrary because you don’t get to come to America if you’re a terrorist, criminal, have communicable diseases, etc. So if a system is going to be based on arbitrary factors, what’s wrong with deciding that one of the criteria is economic benefit to the United States? Indeed, maybe I’m too myopic because of my background and training, but it seems like economic benefit should be a factor that everyone can support. After all, these won’t be people seeking handouts from the welfare system. Consider these passages from a recent New York Times story about all the EB-5 money that’s boosting the Empire State’s economy. Through a federal visa program known as EB-5, foreigners, more than 80 percent of them from China, are investing billions of dollars in hotels, condominiums, office towers and public/private works in the hope it will result in green cards. Twelve-hundred foreigners have poured $600 million into projects at Hudson Yards; 1,154 have invested $577 million in Pacific Park Brooklyn, the development formerly known as Atlantic Yards; and 500 have put $250 million into the Four Seasons hotel and condominium in the financial district. The list of projects involving EB-5 investments also includes the International Gem Tower on West 47th Street and the New York Wheel on Staten Island. …In the last four years, the program’s popularity has surged. In fiscal year 2010, 1,885 visas were issued. But by fiscal year 2013 that figure jumped 354 percent to 8,564, according to government data. Last year, the entire annual allotment of 10,000 visas had been claimed by August — before the end of the fiscal year in October. This year the quota was reached even earlier, on May 1. As an aside, this program isn’t attractive to those with lots of money because of America’s punitive tax system. “This program is not for the very rich in China, because the superwealthy do not want to pay U.S. taxes.” Instead, he said, the wealthiest Chinese prefer to have their legal residences in low tax jurisdictions like Hong Kong or Singapore, and then take advantage of 10-year tourist visas to the United States. While I’m tempted to now explain why we should fix our bad tax system, let’s stick to the topic of immigration and delve further into the issue of whether it’s good to attract economically successful foreigners to America. Some scholars say the answer is yes, but they think the EB-5 program is inefficient. Here’s some of what Professor Eric Posner of the University of Chicago Law School wrote for Slate. The program is a mess. …it’s almost impossible to figure out whether a specific investment generates jobs rather than reshuffles them from one place to another. There have also been examples of outright fraud and political cronyism. Part of the problem is a lack of documentation but the real problem is that the program is misconceived. …the price we charge for citizenship is extraordinarily low. …A shrewd investor will find an investment that pays a couple percentage points below the market rate. If he invests $500,000 in order to obtain, say, a 6 percent return rather than an 8 percent return, then the true price he pays for U.S. citizenship is $10,000 in foregone return. Gary Becker, the late University of Chicago economist and Nobel laureate, once proposed that the United States should sell citizenship to foreigners for a flat fee. The EB-5 program approximates Becker’s proposal, albeit in the most inefficient way possible. Becker argued that citizenship is a scarce good just like tomatoes and hula hoops, and is thus subject to the law of supply and demand. America owns visas and should sell them to willing buyers at the market-clearing price. We would attract immigrants who are skilled enough to earn wages that would cover the fee, and we would gain again from the tax on their wages once they began work in this country. These types of immigrants—the ones who could afford the fee—would be least likely to burden the public fisc by needing welfare payments. The Becker plan, which Posner basically supports, certainly would be simpler than the EB-5 program. And it presumably eliminates the instances of corrupt cronyism that taint that otherwise good system. Moreover, many of the nations with economic citizenship programs use this approach. But here’s the downside. If you sell citizenship directly, the money goes to the government rather than to the productive sector of the economy. That might be acceptable if it meant that the politicians reduced or eliminated some tax. But I fear the real-world impact would be to simply give the crowd in Washington more money to waste. So perhaps the real challenge is to figure out some smarter way of operating the EB-5 program so we get even more private investment and job creation while also reducing opportunities for cronyist intervention. P.S. If you want to enjoy some immigration-themed humor, here’s some involving Peru and Canada. P.P.S. While I don’t like government getting more money, that shouldn’t be the only factor when grading a policy proposal. I fretted, for instance, that pot legalization in Colorado would be a mixed blessing because it would generate more tax revenue. But thanks to Colorado’s Taxpayer Bill of Rights, the politicians haven’t been able to spend all the new money, so it’s unambiguously a win-win situation. I think we should import people that will go on welfare and other state support programs. Because these types of immigrants will eventually become solid Democratic voters with Socialist tendencies. It will be one way to finally form a solid permanent majority that will finally force the rich to pay us the money they owe us. That is the quickest path to prosperity and our entitlement guarantee that as middle income Americans we remain in the world’s top five percent. on May 22, 2015 at 11:37 am Guest Article: Should we Encourage Rich Foreigners Who Invest in the United States?